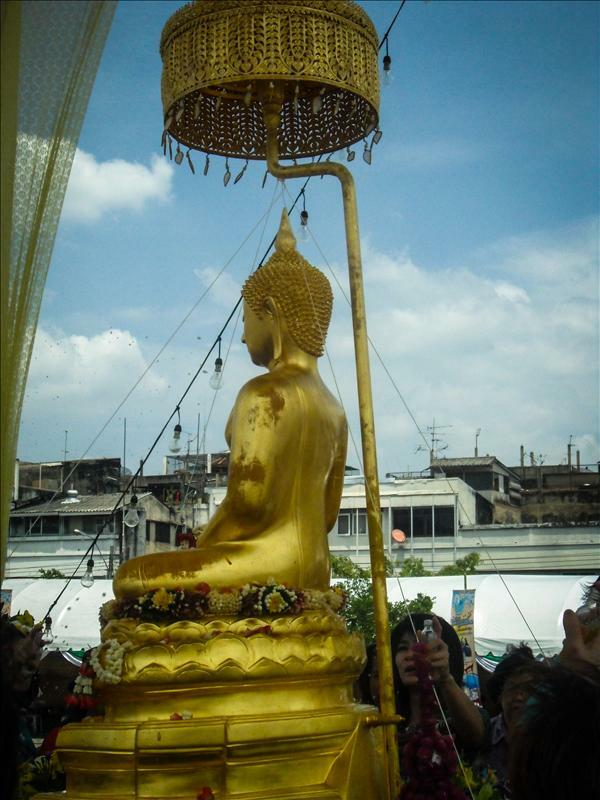 Thailand: known for it’s ever smiling (sometimes gender ambiguous) citizens, golden Buddhas, monumental glittering mosaic temples, pristine beaches and coral reefs. Wheels hit the runway and bring my speeding plane to a halt in a way that I, being uneducated in the laws physics, still can’t get my mind around; I touch down in Bangkok. Trying to think of a way I could warp the phrase “touch down in Bangkok” into a clever euphemism consumed most of my time in the airport. 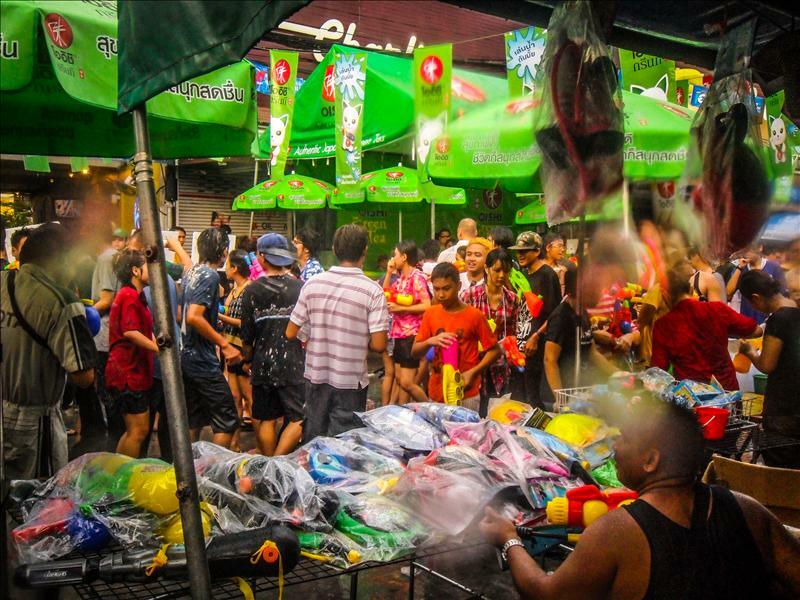 Failing at creating something funny, original and inappropriate to snicker over, I settle into the back seat of a Barbie pink taxi sporting a license plate of squiggles curling in on themselves that would transport me to the wonderful world of Songkran. 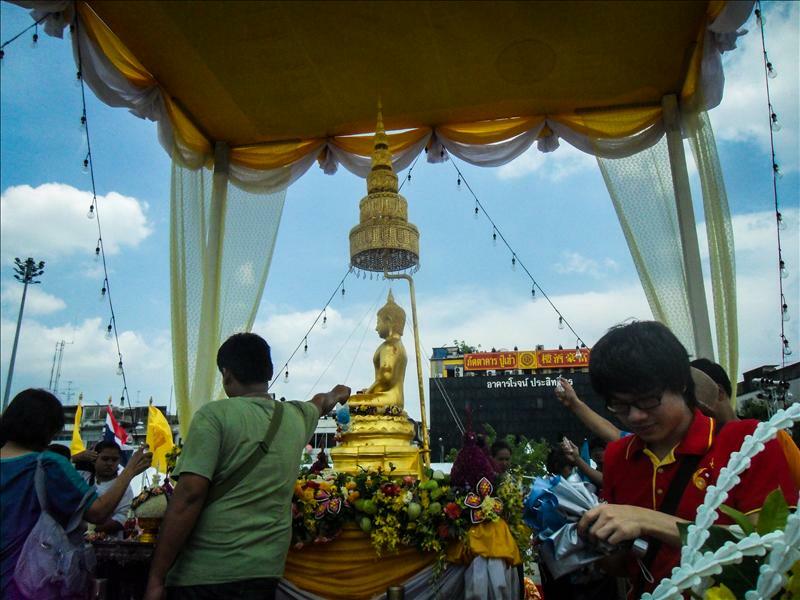 The Songkran festival celebrates the Thai New Year and plays on the tradition of washing the many Buddha statues all over the country with scented water, lighting incense, leaving lotus bulbs and praying for a year of good luck.. Somewhere along the line, with a happy creative twist, it turned into a 3 day long, country wide all-out water war incorporating any water projectile device ranging from bucket to elephant and people of every age exchanging smears of white paste on smiling cheeks. Just after landing Shane and I find ourselves hesitantly wandering the streets of Bangkok headed towards Khao San Road, empty handed and open hearted to the promise of simple childlike debauchery: both of us desperately striving to be the first to wipe paste on the other and spray them in an especially merciless way that can only be inspired by love. 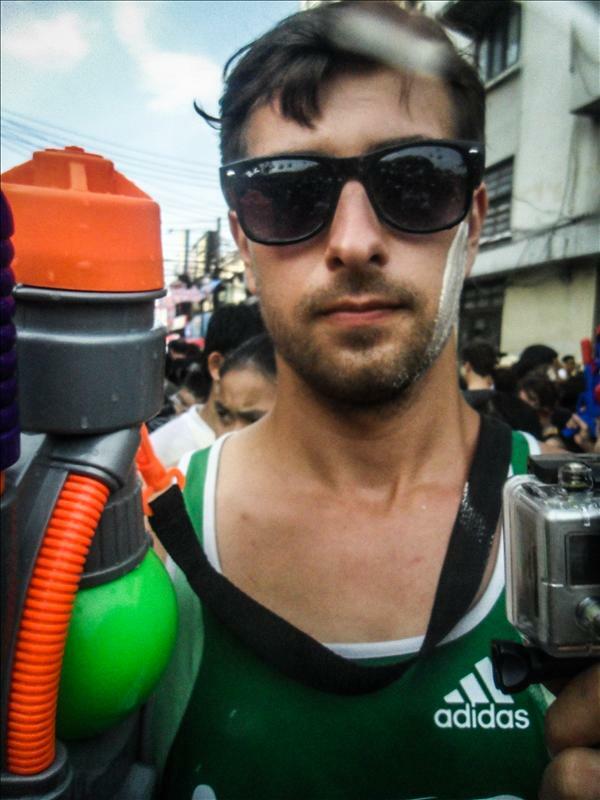 After a few shots to the face we find ourselves half soaked 30 seconds in and decide the AK-47’s of water guns are our newest necessities and arm ourselves with ice cold water sure to send unpleasant shivers down the spine of unsuspecting victims in the tropical air thick. The atmosphere is thick with streams of gunfire and streams ribboning from hoses. 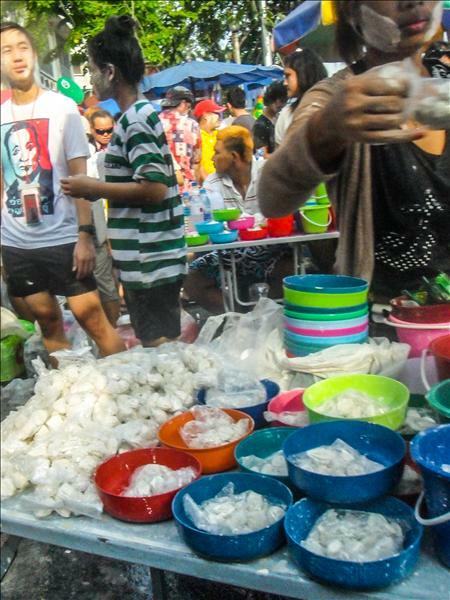 The streets are lined with people dancing in wet uninhibited celebration, vendors selling inferior guns, ice water to fill them and golden liquid courage for battle. In the center there are a thousand smiles some accompanied by hazy eyes and some full of youthful excitement. I stop to threaten a two foot tall soldier with certain demolition and am met with fierce dark eyes and tiny fingers pumping a trigger to fuel a stream that almost reaches my shoulders. This brave little man darts forward in brazen disregard for the power of the Super Soaker 5000 and I shoot a stream that splashes at his feet and onto most of his body, he backs down. My first defeat and I’m not ashamed that it was a 5 year old because he was particularly militant for his age. The rest of the night splashed by in a haze of saturated madness and ended in me watching with fixated wonder while a woman made pad thai at a street stall for Shane. At my suggestion, we continue with early afternoon sniping from the balcony of our hotel as we pre-game for the war. Shane and I carefully pick out targets and eliminate them with efficiency while sipping on cocktails. Children are the easiest and best targets, second only to the beer tank top wearing muscle men ready to party. Business men and people carrying electronics are innocent civilians and are off limits. 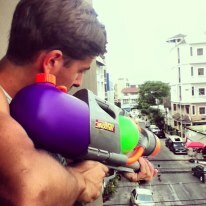 By the time we make our way back to the battlefield on Khao San road we’ve had enough target practice to make us a mean, fighting team. The streets are packed and for a moment my mind flashes over to friends at Coachella standing in a crowd as tightly packed as the one I’m in right now trying to get a glimpse of the stage. 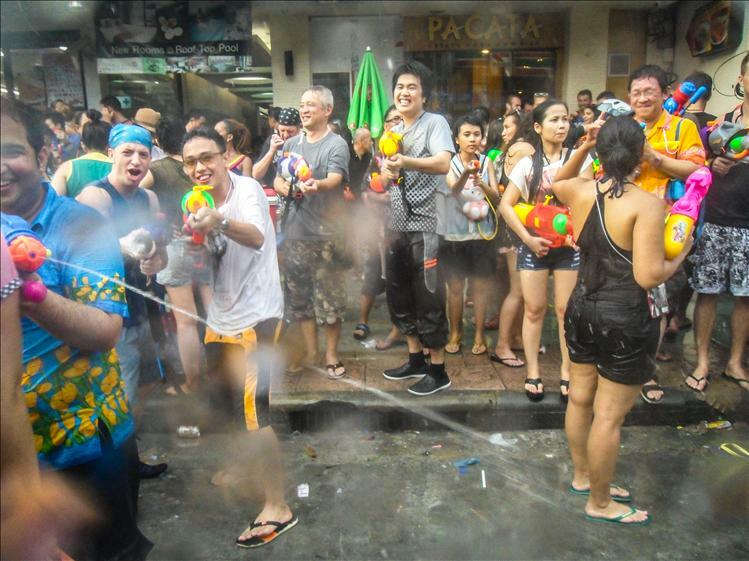 Here the whole street is a stage for the ecstatic frenzied water fight of a lifetime with people from all over the world taking part in the universal language of laughter and unabashed random attacks. The hours pass in baby steps and streams of water shot in the faces of countless strangers. Leaving Khao San road, we top off the night with a cross cultural exchange and are adopted by a Thai family drinking and eating on the street and soaking the completely open tuk-tuks and cars carrying people. I engage in a very personal heated fight with a pair of 8 year olds using human shields and ducking behind objects between sending streams of water to hit any unblocked part of my body. Two against one is not a fair fight even when you do have a better water gun than the both of theirs combined so I grudgingly surrender my weapon to so that they can avert their targets back to the passing cars. 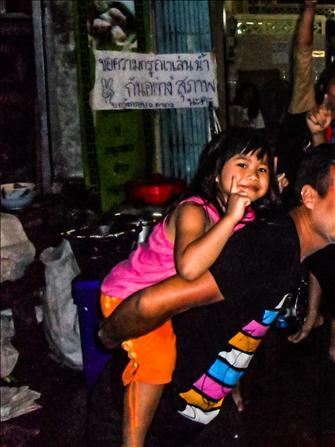 I take up a bucket alongside a Thai girl about the same age as me and we exchange smiles and nods signaling when to ambush the passing vehicles on the street. 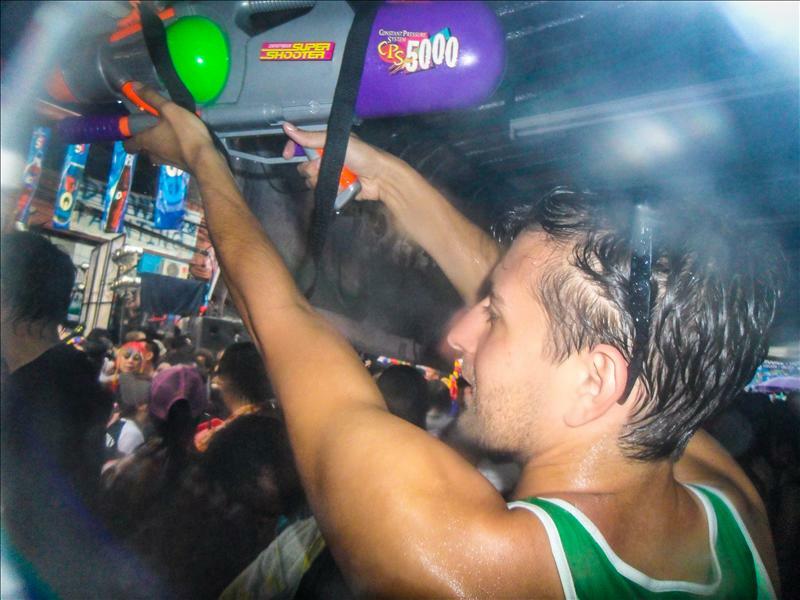 Every time I look behind me Shane is exchanging fresh banter and high fives with his new Thai bros. Every time I look to the side the boys are aggressively pumping the super soaker and treating it like a golden machine gun. I fall into sleep fully satisfied with my soak count for the day and my new Thai friends. 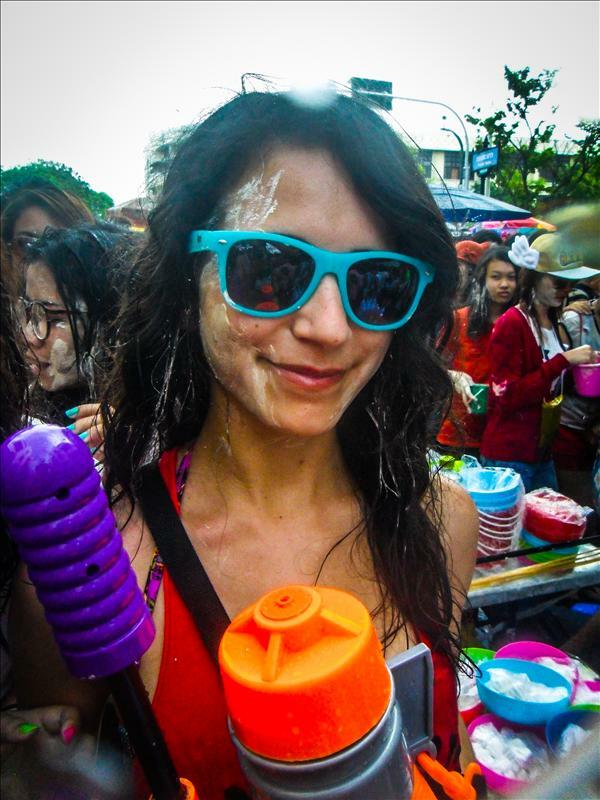 Operation Songkran Complete. this sounds so epic!!! experience of a lifetime! Thanks Mell! 🙂 it was pretty awesome!